Marketers use the term “ancient grains” to describe grains and seeds that are untouched by plant breeding. Grains such as faro and spelt or such seeds as quinoa and teff for example. 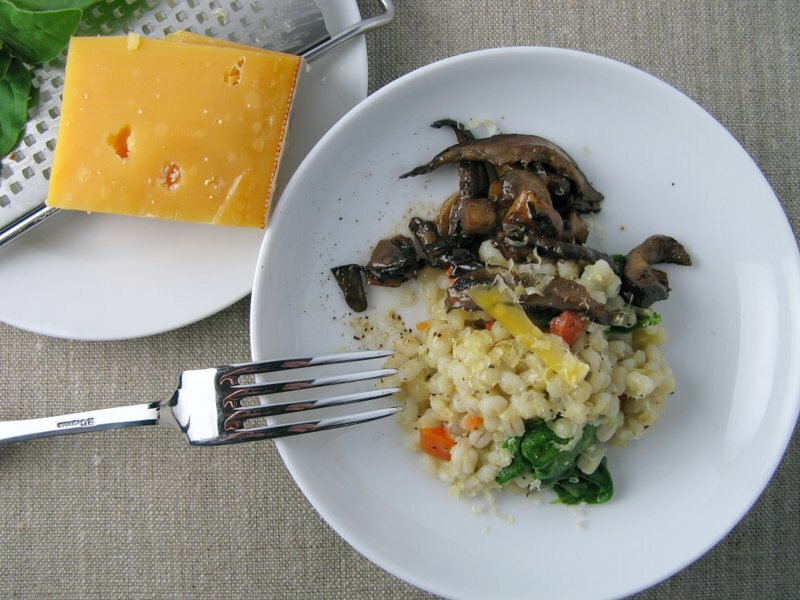 Preparing a webinar for culinary educators on how to introduce such unfamiliar grains into their kitchen classrooms, I came up with this recipe for Barley Pilaf, Mushrooms and Aged Gouda that can be used to prepare many healthful whole grains. The average American diet lacks fiber and nutritious carbohydrates. This is where whole grains come in. Whole grains offer the kind of nutrients we need – a cup of cooked pearl barley has 12 grams of protein, 6 grams dietary fiber and 12% of our daily value of iron. They are low on the glycemic index mitigating insulin spikes associated with eating refined grains. Plus whole grains expand the palette of flavors we have to work with in the kitchen. Start by making this Big Batch of seasoned barley then you can use it for any number of finished dishes. 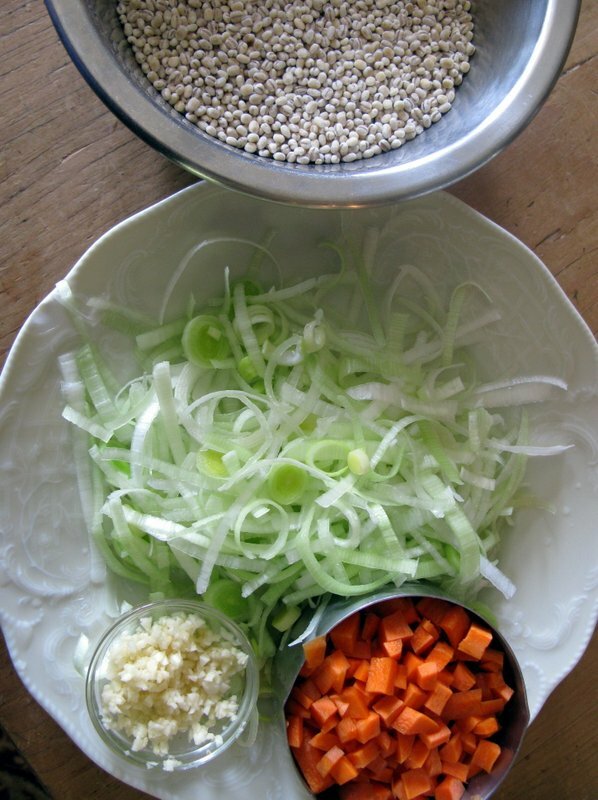 It’s a goes-with-everything preparation method I use whenever cooking whole grains. Once on hand, the cooked barley sneaks into green or bound salads, soups and side dishes. The finished dish here is an accompaniment to braised greens and a piece of grilled fish, meat or vegetables. Or the kind of satisfying lunch called for on a chilly day. 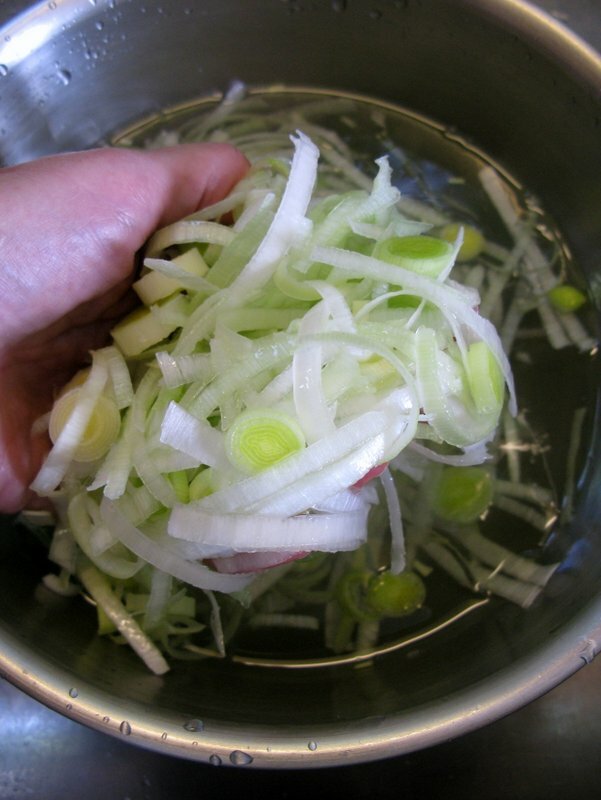 Leeks add a mild onion flavor to barley and other grain dishes. There is a trick to getting out the sand that gets trapped in its tight layers. Slice the leek. Then place the slices in a deep bowl full of cold water. Stir gently and the sand will fall out and settle on the bottom of the bowl. Scoop the slices out of the water and the sand should stay where it landed. Here’s the mise en place for the big batch of barley. You don’t have to be fussy about chopping although I do like to cut carrots into an even small dice. 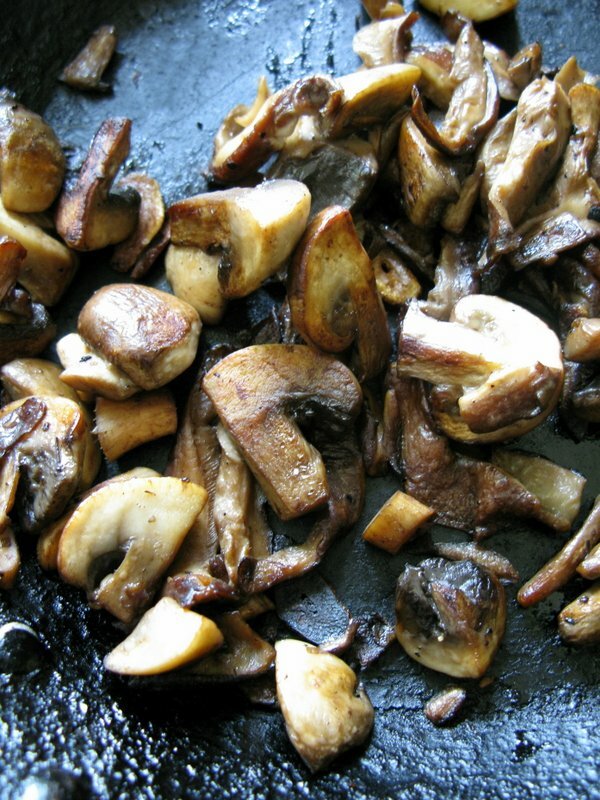 To bring out the deep umami flavor in the simple mushroom garnish, cook the mushrooms long enough so that they release their liquid then absorb it back and turn a nutty brown color. Serve the barley pilaf as is or with grilled shoulder chops of lamb, game hens or broiled salmon, three dishes that seem to go especially well together. This recipe was developed to share with the reader’s of The E List, Erica Tannen’s “Excruciatingly Opinionated Guide to the Connecticut Shoreline.” It’s a weekly electronic newsletter of all that is fun, delicious, healthful and interesting in our area. Everyone that lives here reads it. You should too. Make this Big Batch of seasoned barley and use it for any number of finished dishes. It’s a goes-with-everything preparation method I use whenever cooking whole grains. Once on hand, the cooked barley sneaks into green or bound salads and soups. The finished dish here is an accompaniment to braised greens and a piece of grilled fish, meat or vegetables. Or the kind of satisfying lunch called for on a chilly day. Heat the oil over medium heat until sizzling. Add the garlic and stir for about 30 seconds to release some of its aroma without burning. Add the leeks and carrots. Raise the heat just enough to help evaporate any moisture that clings to them. Cook for 4 to 5 minutes until the vegetables are tender and begin to brown lightly. Season with a little salt and pepper. Add the barley and cook for a minute then add 4 cups of stock and the thyme. Bring to a boil, reduce the heat to low. Cover and cook for 40 to 50 minutes, stirring occasionally until the liquid is evaporated and the barley is chewy tender. Prepare the mushrooms while the barley cooks. Heat the oil and a Tablespoon of the butter in a 10-inch skillet over medium high heat until it sizzles. Add the mushrooms, stir and let cook until they release their juices then start to brown, for about 6 to 8 minutes. Add the red vermouth and cook until reduced. Then stir in the remaining butter and season with salt and pepper. To serve, toss the spinach into the hot barley, reheating it if necessary. Stir until it wilts. Season the barley liberally with salt and pepper. Reheat the mushrooms if necessary. 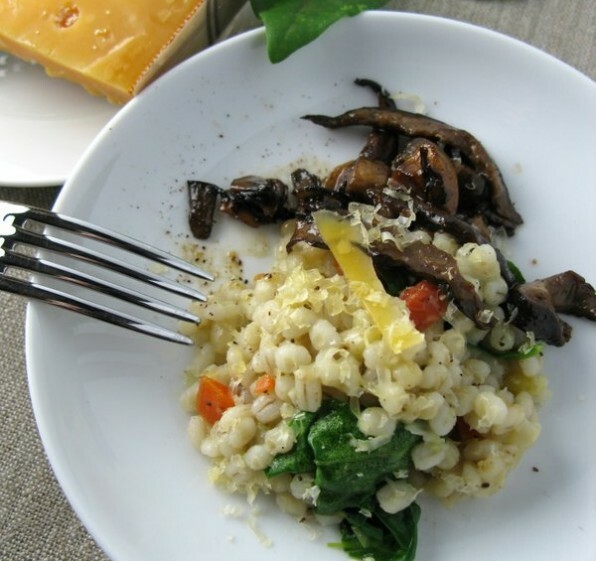 Serve each portion of barley with a few spoonfuls of the mushrooms. Shave aged Gouda cheese over the dish.